If you are looking for the ideal place to organize the perfect wedding or an unforgettable event, Lo Zerbo is the best location you could ask for. Steeped in history and surrounded by an unmatched natural environment, it is a location where luxury and elegance come together to create something unique. Ancient Milanese dialect had a phrase to translate the concept of “fallow land”. It was “lasciare andare a zerbo” (literally: ‘let the land at zerbo’), in which the word zerb meant ‘unripe’. It was the practice of giving some rest to a plot of land or to a part of it for the span of one year. In this way, the land would have regained all the basic nutritional properties to ensure a good harvest after twelve months of rest. By the influence of the nearby city of Milan, low-Lombard society quickly turned to an industrial society. Because of that, the word zerb left the common usage. But not topography. In the modern Lo Zerbo area, in fact, there is an old chapel where you can admire a splendid specimen a painting showing a Virgin Mary with child. Originally called the “Blessed Virgin”, it was eventually named “Madonna dello Zerbo” (‘Our Lady of Zerbo’), a denomination that rapidly extended to the church itself and to the entire area. Today Lo Zerbo is the ideal luxury location for setting up an unforgettable wedding and other events. It is a vast, gorgeous location that is able to satisfy every requirement from spouses or organizers. And such inclination to hospitality is due to what we might call “the four souls” of Lo Zerbo. These are the four key points that make the entire area a jewel of logistics excellence; a model of how a homely atmosphere should look like. It was the famous architect Piero Portaluppi to design, during the first half of the last century, the enchanting villa. Today the structure counts 4 rooms that can be used both by single guests or couples. Each room overlooks the nearby rose garden, thus creating a fairytale atmosphere that every bride deserves for its best day. The property includes a wide entrance and a large living room (in both of them there is a fireplace); an elegant dining room and a historical library. The park covers twelve acres and serves as a common denominator to all the natural and architectural wonders that Lo Zerbo can boast. In here, the villa, the historic church of the eighteenth century, the ancient house of the sixteenth century are located and connected to each other by a colonnade. There is also a precious Giardino all’italana (garden in Italian style), which gives to the entire complex that Renaissance flavor worthy of a proper luxury location. A paradise where setting up a photo shoot. The church is the pride of Lo Zerbo. Octagonally shaped, with a brick floor and vaulted ceilings, the building is consecrated and drips with history and tradition. On the inside, it is possible to see the painting that also gives the name to the structure, but it is not the only piece of art. In fact, the walls and the vaults are painted with angelic motifs, and three arched entries guarantee royal access to the building. In the best day of your life, here you can celebrate the civil ceremony among the finesse of a plain, yet refined, art. The fourth soul of Lo Zerbo is its tensile structure. It is an example of how modernity can harmoniously combine with the antique, and how the work of man is able to marry the perfection of nature. Freely customizable, it allows to about 200 people to have lunch or dinner protected from any atmospheric disturbances. If requested, it can be used as a dance floor. By masterfully blending tradition and modernity, elegance and class, natural environment and technological innovation, the four souls of Lo Zerbo contribute to the creation of a unique, magical and fully customizable atmosphere, for every event. It is possible to reach Lo Zerbo in less than one hour’s drive from Milan. The nearest town is the charming village of Besate, whose citizens are called besatesi. Here, it is possible to admire the Church of San Michele Arcangelo, which has been refurbished in the seventeenth century. The area in where Lo Zerbo is located today has been an important chapter of besatesi’s lives for a long time. Here, they decided to raise an oratory at first, then, in the eighteenth century, the chapel which still characterizes as one of the wonders of the complex was built. Besate citizens themselves paid for the construction of the church, as an act of devotion for having escaped a terrible plague. 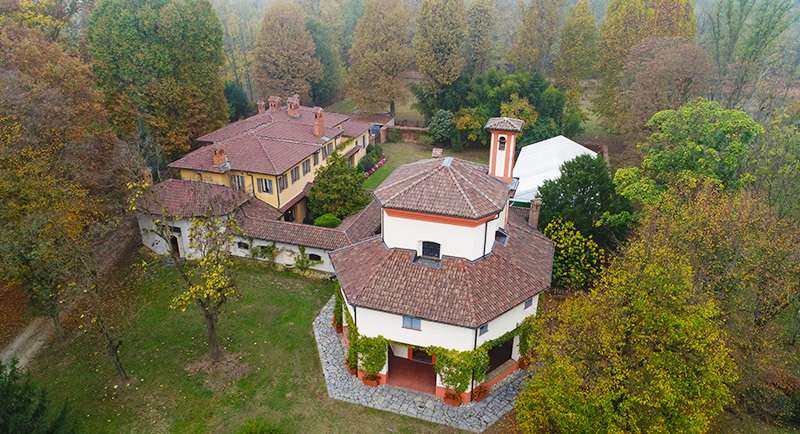 The final added value of this property is definitely the fact that it is located inside the Parco del Ticino: the oldest Italian natural reserve which has ensured the surrounding environment to maintain its unchanged beauty. Inside Lo Zerbo’s walls, you can dive into this very same beauty. Because of its location and its history, as well as the quantity and quality of the services it can offer, Lo Zerbo is the ideal location for the most perfect of weddings. Also, you can arrange here your graduation party and birthday, or a conference, a corporate meeting, a music night. The wide parking area allows parking every guests’ cars safely. Moreover, the villa, the park and the tensile structure do not set any limit to the organizational possibilities. Lo Zerbo’s staff can also provide additional services such as catering, floral decorations and hosting personnel. More: meeting equipment and audio/lights service thanks to our collaboration with selected suppliers. Because of its natural adaptability to an endless range of scenarios, Lo Zerbo also qualifies as a perfect setting for photo shoots or films, such as commercials, dramas and movies. Distant only less than one hour’s driving from the city of Milan, Lo Zerbo is the ideal place to set up the most beautiful moments of the day that will remain forever in the memories of your guests. It’s all in one place, without any further relocation. Lo Zerbo means style, class and elegance, in harmony with the perfection of the surrounding nature.